Face Value: Eh. It’s all right I guess. It’s not inauthentic or particularly egregious. 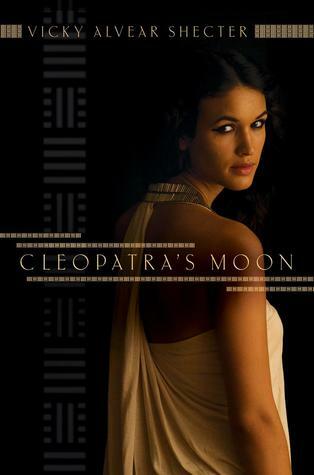 But Cleopatra Selene* is one of those characters who is hard to actually create an image for. Nothing the publishers could put on this cover would really match up to my image of her, and something about this feels too contemporary, too pretend. It lacks the actual rawness of the story inside. Does it Break the Slate? YES! Ohmygod yes. This is a book that goes beyond simply having Slatebreaking characters (which it does) but actually engages in serious conversations about feminism and gendered expectations in a way that is historically appropriate & relevant to the story. It’s awesome. Who would we give it to? On Goodreads, this book is described thusly: “The Luxe” meets the ancient world in the extraordinary story of Cleopatra’s daughter.” To be honest, I think that’s kind of an unfortunate representation, since the writing is a lot higher quality here. But yes, this is historical fiction with intrigue and some sexual activity. So if you liked The Luxe, yeah, you might be into this! But also, if you thought The Luxe was badly written and sort of uninteresting, you still might be into this! *As a side note, I realize that using Cleopatra Selene’s full name throughout this review is cumbersome. But when she is in Rome, shortening her name to just Selene is used to diminish her, so I won’t do that here. And shortening it to just Cleopatra is confusing, because throughout the book, that is clearly her mother. So full name it is! Review: Cleopatra Selene, daughter of Cleopatra and Mark Anthony is born into privilege, royalty and power. Our story really begins in her childhood, as we see her grow up, becoming aware of her status, and her family’s within her world. She idolizes her mother, the Queen and Pharoh of Egypt and aspires to be like her, to achieve that kind of power and respect. And as she grows up alongside her twin brother Alexandros Helios and younger brother Ptolemy Philadelphus, Cleopatra Selene is proud of her place in the world. But of course, we know that things can’t stay good for this family. Octavianus (we know him, historically as Augustus), Julius Caesar’s heir declares war on Egypt, they lose their battles, and both of her parents commit suicide. Cleopatra Selene and her brothers are sent to Rome, where they become wards in their enemy’s house, where Cleopatra Selene grows into a young woman, trying to survive, protect her family, and get back to Egypt. The storytelling is intoxicating, with beautiful descriptive passages and high suspense from chapter to chapter. “Why do men blame everything on women? I blurted. “And what is Isis blamed for?” Mother interrupted. Mother leaned back and smiled. She looked so satisfied I almost expected to hear her purr as loudly as Hekate on my lap. I smiled back, not quite sure why this answer pleased her so much. Cleopatra Selene never questions her right to be educated, to rule, and to make decisions over her own life, and so is particularly distressed by the way women are treated in Rome. She’s shocked at the treatment of women, even allegedly powerful ones, to the point where girls are not even given their own names. All daughters are named after their fathers, so, for example, her father’s children with Octavia are named Antonia the Elder and Antonia the Younger. She bristles again at Octavianus’s platform to restore Roman piety, which she sees as being meant largely to discredit her parents and take agency away from Roman women. I stiffened. He would, I knew, find some way to insult my parents iwth this campaign. “And if the wife catches the husband wtih a lover?” I asked. He looked blankly at me. “There is no consequence for the husband cheating? “Well, no,” Juba said, seeming nonplussed by the very question. I sighed. Of course not. Queen Cleopatra is given a fascinating characterization in this book. Shecter beautifully sidesteps a lot of the stereotypes that often surround this woman, and more than that, she addresses how these stereotypes might have been perpetuated over time, calling into question the over sexualizing and diminishing of the Queen’s power. At the same time, she does not make her a perfect hero either. Cleopatra Selene has to ultimately come to terms with the fact that her mother, while a strong and wise ruler, might have made choices that weren’t right along the way. To emulate her mother’s strength does not condemn her to her mother’s choices. There’s romance in this book, but it’s not the love triangle that the cover and back matter would have us believe. Here’s the thing. Cleopatra Selene, as she tells the priestess of Isis, chooses power. She chooses herself and her political goals and her legacy over her romantic desires. So while there is clearly one character who she is in love with, and one character who she is sexually attracted to but personally disconnected from who may offer a political benefit – that isn’t actually a love triangle. That’s Cleopatra, learning to make adult decisions about her sexuality and her strength and her power. She might make some wrong choices, but she’s driven by her personal ambitions, not her inability to choose between two men. We see her slowly fall in love with Juba, who admires her intellect and respects her ambition, and demonstrate annoyance with Marcellus, who constantly refers to Cleopatra s having “bewitched” him. Even as she kisses him, she “groaned inwardly, hating how men blamed their own lusts on women’s ‘magic.’” So yes, there are two men with whom Cleopatra Selene interacts with sexually. But no, it’s not a romantic entanglement. It’s sheer political strategy. I hadn’t known much about Cleopatra’s children before I read this book, and a quick Wikipedia search reinforced how strongly the writer did her research before crafting this completely compelling tale. This entry was posted in Reviews, Young Adult and tagged Cleopatra, Egypt, Feminism, Historical Fiction, Rome. Bookmark the permalink.